My history with Roger Ebert begins as a loyal reader of his weekly reviews, and ends with a better knowledge about what it means to be a viewer and lover of movies. As a teen I didn’t fully grasp the behemoth personality and legacy that is Roger Ebert, and it really wasn’t until recently that I discovered the immense impact that he had on the world of cinema. 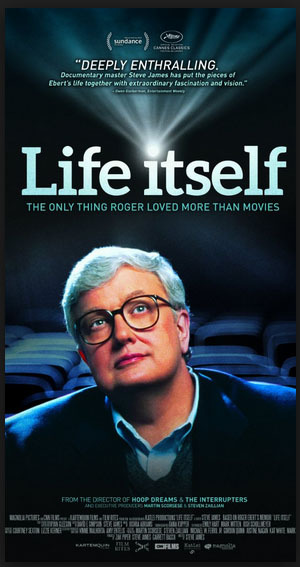 In 2011, Ebert published his memoir Life Itself, and it’s with this film of the same name that director Steve James (Hoop Dreams) seeks to use Ebert’s most beloved medium to document Ebert’s final battle. What Life Itself manages to do so well is tell the story of Ebert’s life as it pertains to his most recent struggle with illness. We go back in time to his beginnings at the Chicago Sun-Times, a publication that despite its “lesser than” reputation among other more prestigious printed media, Ebert staunchly remained loyal to throughout his career. We look at his early troubles and ultimate triumph over alcoholism, and then later his complex relationship with fellow movie critic Gene Siskel. The archival behind the scenes footage of Siskel and Ebert’s show At the Movies is an intriguing (and oftentimes hilarious) insight into their relationship, one of Ebert’s most important along side his wife Chaz. Intercutting the past with footage of Ebert’s most recent stints in the hospital in early 2013, I was hit hard by the impact such an illness has on a man as tenacious and driven as Ebert. It’s heartbreaking to watch at times, but Ebert, never a victim, ploughs through the discomfort of a throat-suctioning procedure, his laptop (and voice) never far from reach of his hospital bed. James, Chaz, and the rest of the world no doubt hoped that Ebert would make it to the release of the film, but it was not to be. 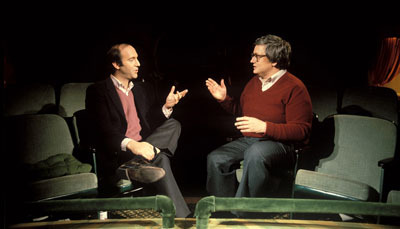 Included are Ebert’s final email correspondences with James, about his fatigue in answering questions for the film, and his need for rest. In the end, it was Ebert that welcomed the act of letting go, and in true Ebert fashion, influenced others to do the same. It is a beautiful final lesson from a man whose sole purpose in life was to bring the joy of movies to the “everyman,” a person he always identified with despite his enormous success. As a companion piece to the memoir, Life Itself won’t offer too much new information on Ebert to the well-initiated, but it hardly matters. Upon leaving the theater, I felt refreshed, inspired even, to continue to contribute in what little way I can to the world of movies and those who share my passion. Just as Ebert would have wanted. Life Itself opens today at the Ritz Bourse.